Before he makes his appearance in The Girl with the Iron Touch, Jack Dandy had an adventure of his very own. 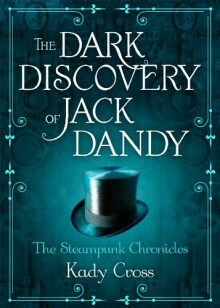 Learn how his actions set the plot in motion in The Dark Discovery of Jack Dandy, a short teaser story from author Kady Cross's Steampunk Chronicles.Jack Dandy didn't become prince of the London underworld at barely twenty-one by being softhearted, even if a certain girl in a steel corset has wormed her way into his affections of late. He knows how to manipulate, charm and rob people blind. And if his criminal activities embarrass his aristocratic father, so much the better.So when a friend of Jack's father hires him for an underhanded job, Jack is happy to oblige—for an outrageous fee, of course. Delivering a mysterious crate seems like an easy task—until Jack realizes just what is inside…Don't miss the conclusion to Jack's escapade in The Girl with the Iron Touch by Kady Cross, available now from Harlequin TEEN. http://Jazabell.booklikes.com Jazabell 4.0 "A phoenix. That's what she was-a gorgeous mythical creature rising from the ashes." text "A phoenix. That's what she was-a gorgeous mythical creature rising from the ashes." This was a well written short that let us have a glimpse of who Jack Dandy is and has he is fast becoming a favourite character I was keen to learn just a little more about him.He likes to play tough but we also learn he has a softer side.